Dennis George, the Quizmater, hosted the first annual Buffalo Sports Page Radio's Sports Trivia Challenge. If you’re a sports trivia fan, make sure you tune into Buffalo Sports Page Radio’s show on WECK 1230AM/102.9FM Saturday morning from 10am-12pm. The Quizmaster, Dennis George, will be leading a sports trivia challenge competition between the Buffalo Sports Page staff. 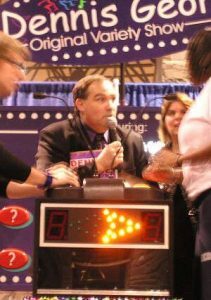 Dennis is WNY’s premier game show host and trivia game expert. While many of his shows focus on general knowledge, he is an avid sports fan who loves to come up with challenging sports questions. He’ll put the test to three teams. BSP staff members Paul Peck, Budd Bailey and Bob Gaughan will each lead a team. The two highest scoring teams will battle for the BSP Trophy during the final half-hour of the show. Here’s the way for all WNY sports fans to take part in the show. Snide comments and heckling of the contestants is welcome, and will be monitored by Buffalo Sports Page social media guru Brad Gelber. Buffalo Sports Page Radio is Live every Saturday morning from 10am until Noon with guests, analysis and your phone calls.